This painting was a challenge. The weather during the 2017 Olmsted Plein Air Invitational was extreme and varied during the week ranging from wet and 38 degrees to dry and sunny and 87 degrees. We experienced heavy rain, tornado warnings, hail and 24 mph winds. 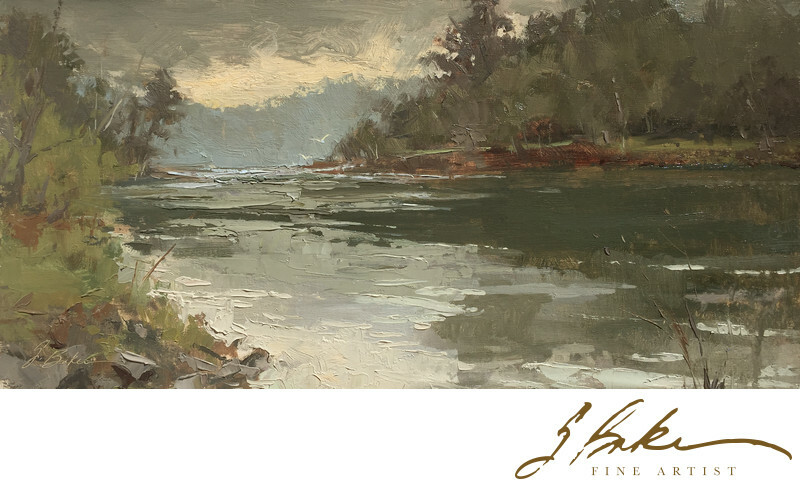 This particular day painting on the Chattahoochee River was particularly stormy. Knowing ahead of time that there would be rain, I ordered a large, sturdy, umbrella with a tripod base. I worked great until the rain commenced coming in sideways! I got very wet, but the painting survived.